There is beauty in adversity,nature has given a pattern of cracks and crevices that is both interesting and inspiring due to the drought. 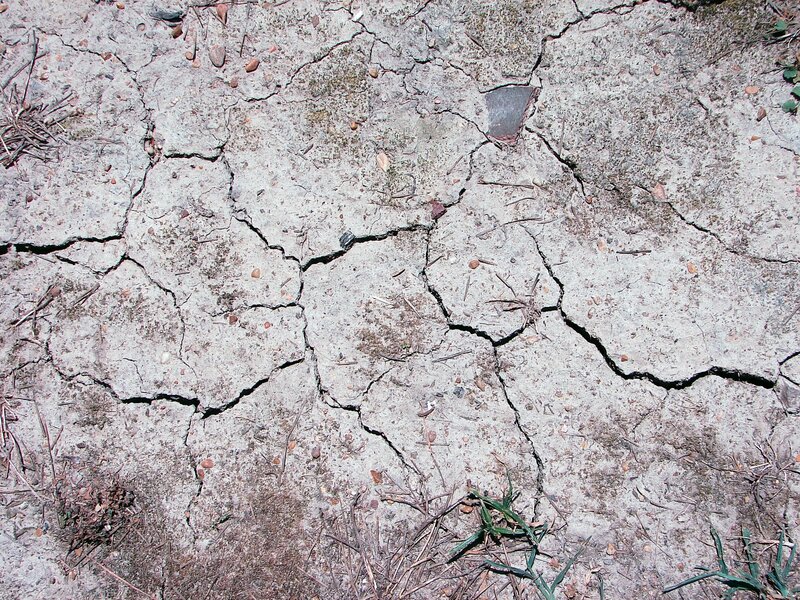 The Delta for all of its beauty has been grabbed by the hands of drought and drained of any remaining moisture, leaving intricate cracks and crevices in the surface of the soil. The lack of rain after the floods of late spring and early summer have given the land a barren parched look and the bits of nature left must suffer the hardship of yet another lash from Mother Nature. The heat of summer is cruel and relentless here. In the studio the air conditioning whirs as the oil paints are applied to canvas. It has been a long time since I have broken the seals of my oil paints and applied their buttery softness to canvas. I have done this month, what I should have done months ago. I have given myself the permission to play in and with the paint. I have talked and preached on and on, about how you should paint what you feel; and not what you think will win a show, sell in a gallery or even worse what will match someone’s sofa. The self preservation quadrant in my brain always seems to deny this effort and I find myself (even if I don’t want to admit it) thinking about the money end of art. I have to support myself with my art and it has become increasingly harder with the times and the economy. I find it much harder to be free to play and paint with reckless abandon and to enjoy the process of letting go of preconceptions. I have convinced myself that I would do this during the summer months. One way I felt I could more easily attain this goal was to change my medium ,so I thought about acrylic, but it was so close to watercolor and what I had been painting in all year, that I chose to go with oils. It has been enlightening to say the least. I started in oils 30 years ago and long since abandoned them for the speed and drying time of watercolor and acrylic. I had forgotten the glow of oil paint and the texture of the paint itself. The drying time for oil is much longer than with water media and the best part of the process is that I am forced to wait, thus giving me time to think more seriously about the work. There are many physical and technical differences in water based and oil based painting but each medium has its own merits. I am finding that it is a good thing to go back and force yourself to relearn the emotions and the physical motions of painting in each medium. My love of paint is more in the manipulation of the paint on the surface, and the oil paint brings new challenges with it. I cannot burnish and blend the paints in the same manner that I use with watercolor and gouache. In water media I can paint in layers and add the successive layers at intervals that are light speed compared to the oils. I am finding the difference for me, comes when I work in layers of oil paint they are more tactile layers, they have a surface quality that is dimensional even if it takes much longer to dry to a state that I can add more layers. I am finding new ways to express my emotions with the oil paint as it gives me an almost dreamlike quality which seems to reside in the thick viscosity and also in opaque quality of the paint. I begin most of my oil paintings with thinned layers and build up to a state much like a novel with chapters that build on the plot of the story. I admit it takes much longer but I feel like I am leaving these tiny pieces of myself trapped in the layers and in the end the meaning and the emotion melt together to give a story, that is hopefully interesting. 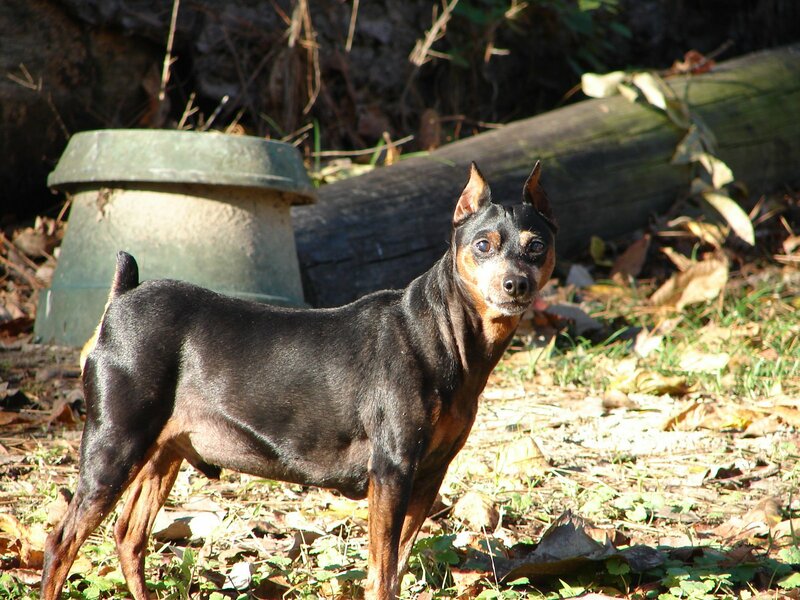 Rocko my 11 year old Min Pin and my muse! I have always had a love for animals and have had numerous pets. I feel a deep connection with animals and the paintings I have been painting as of late are reflections of the love I have for my dog, Rocko. He is a Min Pin and small in stature. What he lacks in size he more than makes up for in his love. He is older now(11 Years) and I feel the need to express the connection I have with him. Rocko loves to go anywhere and frequently he goes in the boat with my husband and I when we ride on the river. This summer a weird phenomenon occurred during the rising waters of the flood. My husband and the carp that jumped in the boat. The carp looks damaged but he swam away with no problem so I don’t think he was mortally wounded. 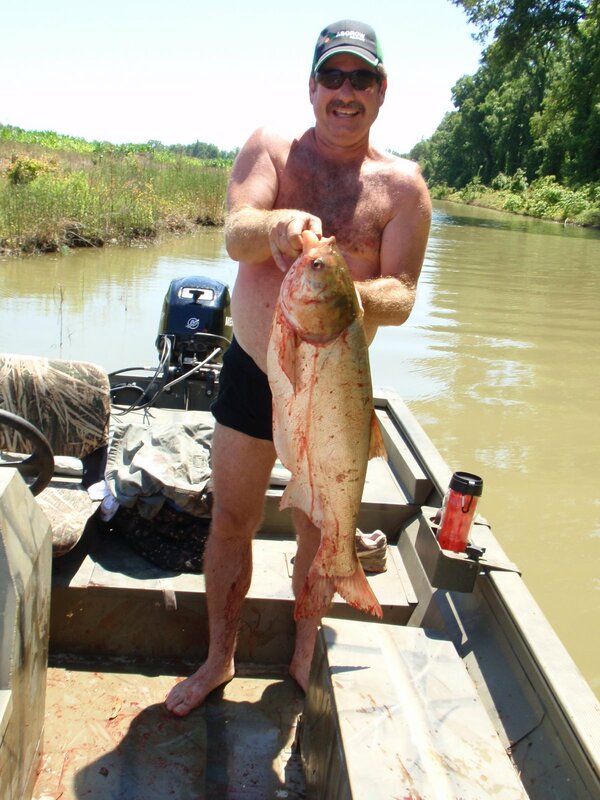 Asian carp fish were in the smaller tributaries and when a boat would approach they would jump in the air. They were incredible to watch as they could leap sometimes 10 feet into the air and often times they would jump in the boat with us. It was a painful experience if they hit you when they boarded the boat, I might add. Anyway, as I like to paint my thoughts and feelings about life, it occurred to me that I should paint how this experience with the fish, the summer,my life with Rocko, the river, etc felt and the way this one experience was indelibly printed in my memory. I then decided to think about the symbolic aspects of the painting of a figure, a boat, a river, a dog and some fish(in this case leaping) and what this might tell me about why I felt it was important to paint this image. Perhaps the message is in the symbolism, as well. Figure- symbolic of life, when used alone signifies the aloneness of life I used the figure to represent myself and I put very little detail in the figure. I appear really dark as I think weoften tend to view ourself as a mystery. A Dog(in this case,Rocko)- symbolic of a noble and faithful companion in many cultures. I found this interesting that in Africa, the people believe that dogs have a clear vision enabling them to see into the spirit world. I painted my symbol of Rocko as much larger than he actually appears and red as it is a color that symbolizes love. Carp- In China the carp is symbolic of strength and perseverance and if the carp jump with vigor then it signifies a transformation in life. I chose to place my carp in an arc format to symbolize the continuity of my life, it is a circle that often times I cannot see as a whole but that I feel is always in motion and transforming. Boat- a symbol of transport,it could represent your life and the manner you navigate through your emotions. It could symbolize the voyage of your life. A boat could be symbolic of the ark and the animals and their safety. The boat in this painting is symbolic of a transport perhaps to another time and place for me, a part of my journey in life and art. I think these symbols represent a good bit of what I feel about the painting, yet they are interesting and could give another viewer room to relate and feel something more personal to their life. 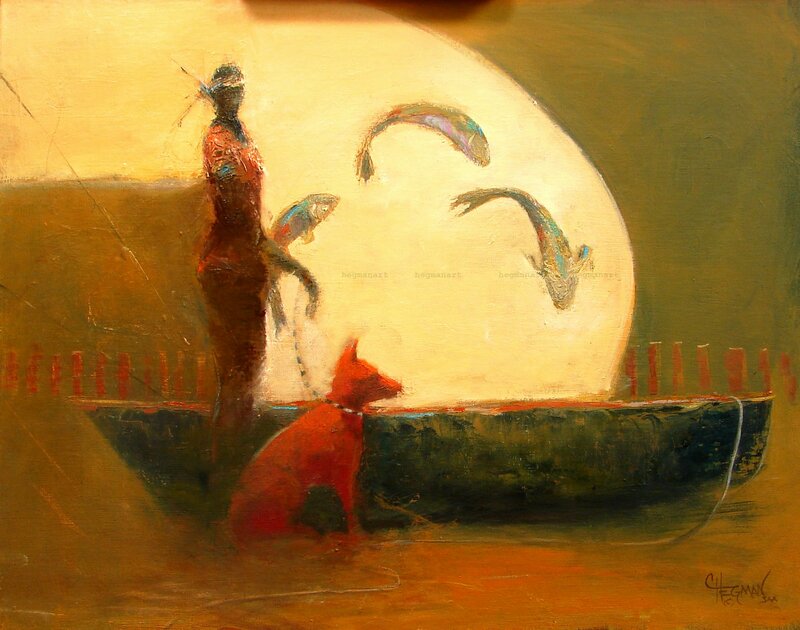 I used many lines both implied and applied in the painting to communicate the connections that I felt were important to emphasize, the line between the figure and the dog, the fishing pole lines, the line on the boat that is resting on dry ground. Lines can be symbolic as they can give a feeling of connection or entrapment depending on the context of their use. Lines can physically link the shapes and are immediately viewed and felt but you can also create visual lines as in the fish in the painting they appear connected by their repetition and direction without the use of a physical line. The shape of the implied line in the fish, the arc, is one I employ in my work often as it has personal meaning for me in my life. I used a very limited palette in this work and found that I could layer and mix hues without end with just a palette of yellow ochre ,cadmium yellow light, cadmium red light, pthalo blue, indigo, and alizarin crimson. The earthy tones lend the feeling I was trying to capture, indicative of my memory of the moments of summer days on the river with my dog. I hope you enjoy this blog and that you will be inspired to look into symbolism in your work and to perhaps leave your comfort zone and use a different medium. I think leaving the familiar will help you to grow in your art work, I know it has mine. >This was a good post, not sure about Rocko seeing too far anywhere… what with the cateracs and all. This is another good painting though, very nice in the color and use of symbols. It's tough to paint what you want as opposed to what will most likely sell. >I love the colors. Your symbolism is interesting. The fiure(you) seems to be an Indian woman. Do you feel native to the Delta?